Everyone has that person in their life who is an avid traveler. This is the person who spends more of their life on the way somewhere than sitting home. We live vicariously through them via the fabulous photos they share in social media. 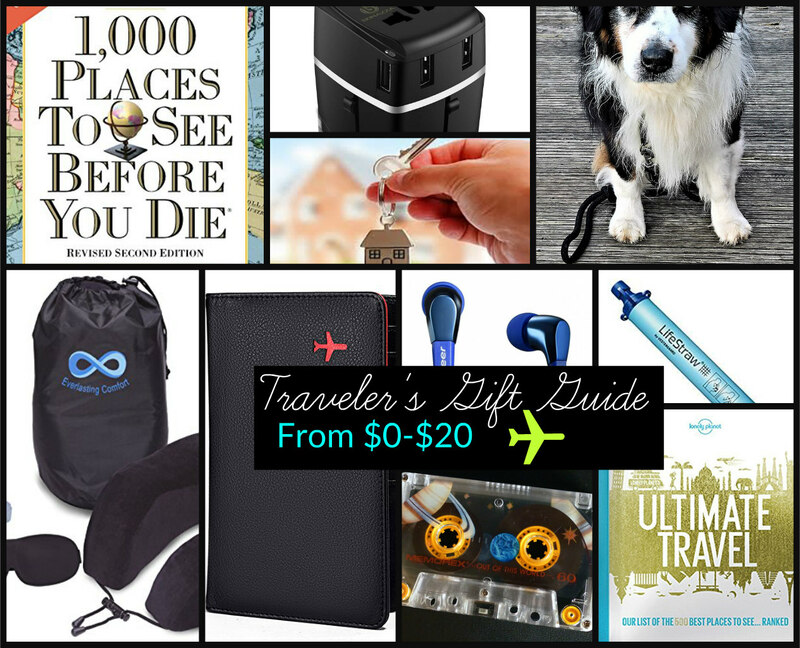 If you are interested in helping to fuel their adventures, consider gifting them something than any frequent flyer would appreciate. All of these gifts cost anywhere from NOTHING to $20! 1. LifeStraw Personal Water Filter ($19.99) – This is a must-have for international travelers especially who have to be very careful about water quality. The LifeStraw Filtered Water Bottle cleans up 99.9% of waterborne parasites & bacteria from water sources in countries where water quality can be an issue. 2. 2. Lonely Planet’s Ultimate Travel: Our List of the 500 Best Places to See($16.99) – The traveler’s bucket list of places to go is constantly growing. This award-winning and very popular book from the Travel Guide experts at Lonely Planet will give them a host of new ideas! 3. All in One Travel Wallet – 2 Passport Holder + Gift Box / cash tickets cards pen ($16.99) – Although frequent travelers are usually organized, they could appreciate another new option to store all the things they need for the flight in one place: passport, ID, boarding pass, money and more. 5. Offer to House Sit a Pet – ($0) – If you wanderlust pal has a pet, you know the cost of pet sitting services can be high for them. Gifting them pet sitting services during one of their longer stints away from home would be much appreciated. 6. Bake a tin of cookies for them to take to the airport – ($5) – Also pretty low cost would be to prepare a tin of cookies, granola or some other snacks that can be taken with them on a flight or at the airport. 7. Everlasting Comfort 100% Pure Memory Foam Neck Pillow Airplane Travel Kit With Ultra Plush Velour Cover, Sleep Mask and Earplugs (Lifetime Warranty) ($18.95) – A frequent traveler doesn’t leave home without the essentials for a long flight across the ocean. This kit included a neck pillow, mask and earplugs to help them get some rest on an extended plane trip. 8. Make them a Mix Tape and put it on a Jump drive, Spotify, SoundCloud or some other service. ($0) – A traveler could always use some new tunes to jam to while waiting in the airport or heading somewhere exciting. Get them in the mood with some of their (and your) fave music. 9. Pioneer Quality Audio Performance In Ear Lightweight Metal In Ear Headphone, Blue (SE-CL722T-L) ($19.99) – Speaking of tunes, the earbuds they give out on the flight cannot compare to a set of quality earbuds. 10. Create a list of Free Events going on where they are heading. ($0) A gift of list of fun and FREE activities that are happening near or around where your travler friend is heading would be a time and money saver when they arrive. 12. Germ Defense Kit – Protect Yourself While Traveling! 30+ Piece Kit – $14.95 – Germs are everywhere in public places and during travel, it becomes doubly important to wipe off surfaces like courtesy phones, counters and more. Your wandering buddy will appreciate this germ travel kit.